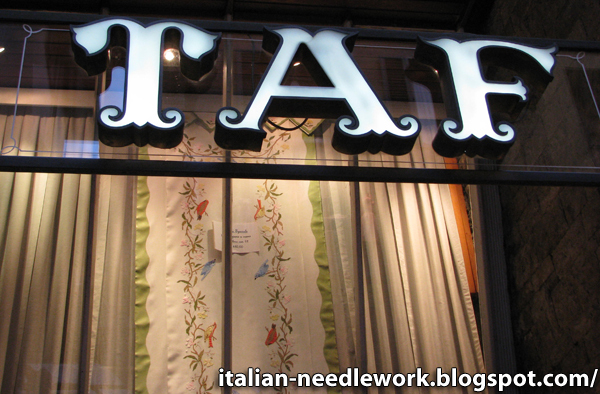 I met so many talented stitchers on my last trip to Italy. 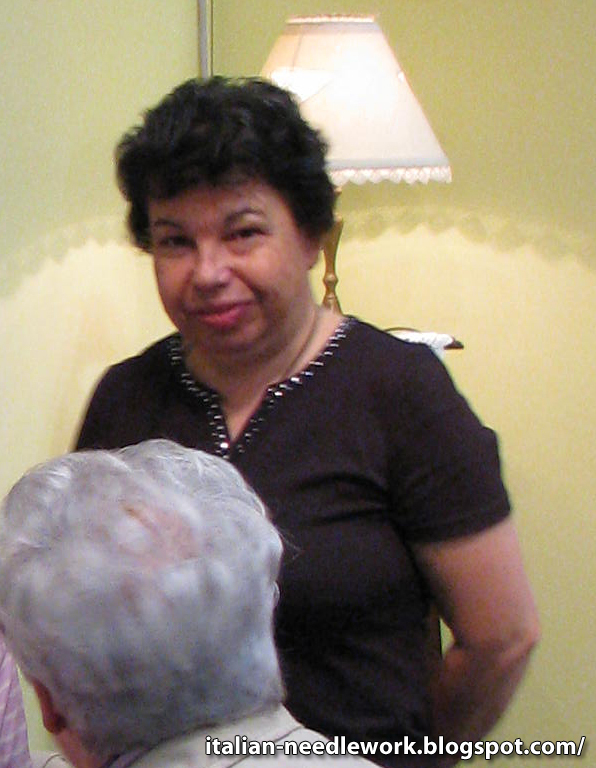 I have to tell you about a fantastic lady from San Vero Milis in Sardinia. 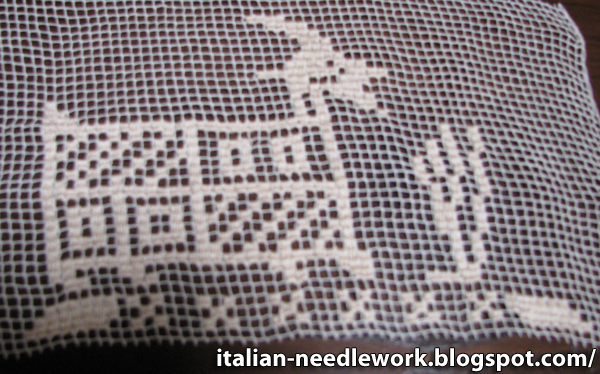 Her name is Rossella and she invited us to her lovely home and showed us lots of her needlework of which I can only show you a few pieces today as unfortunately most of my photos did not come out well. 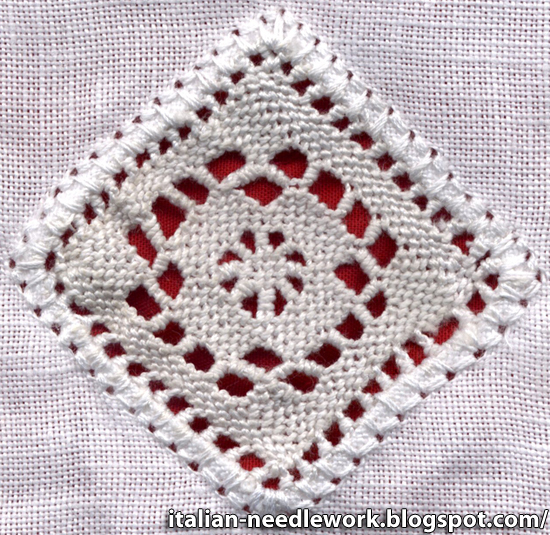 Rossella is curious about all kinds of embroidery and needlework and she has tried many different techniques! 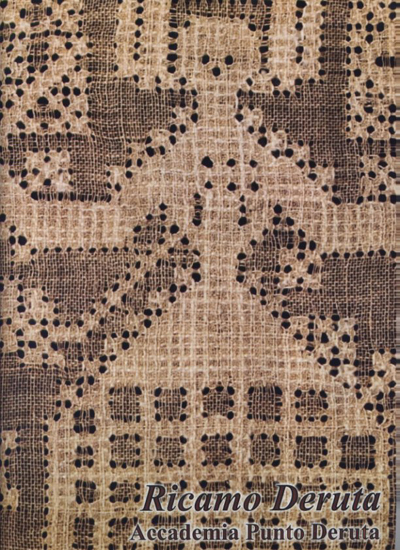 These last two Filet Lace pieces are designs by Maria Lai a famous Sardinian artist who uses textiles in her art. Rossella arranged for us to meet her but I'll tell you about that in another post. After showing us her needlework and offering us coffee and delicious typical Sardinian pastries, we all piled into our cars and drove to Bosa, for a meeting with the ladies from the association La Foce which practices the ancient art of Bosa Filet Lace. Rossella had arranged for us to visit during one of their sessions where many ladies were working on fine pieces of Bosa Filet Lace. I wish we could have spent more time in San Vero Milis, they have lots of artisan traditions and the scenery is breathtaking. I'll have to go back! The Museo del Merletto on Burano in the lagoon of Venice re-opens it's doors tomorrow after years of restoration, reorganization and restructurization! 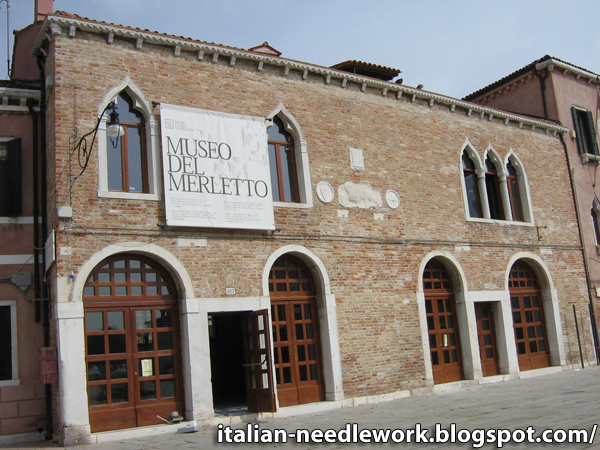 You can find the museum in the Podestà di Torcello in Piazza Galuppi at number 187 on the island of Burano. 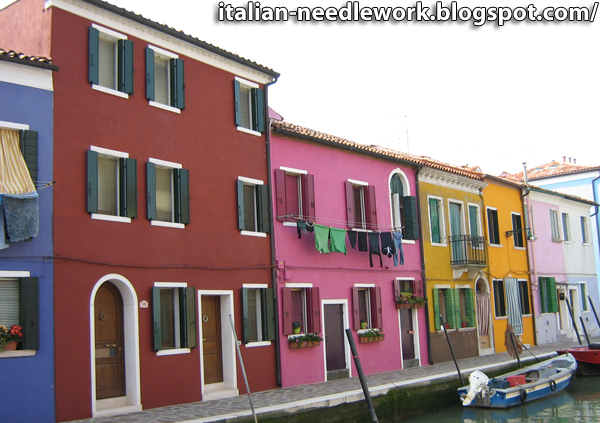 Take the Linea LN vaporetto from Fondamenta Nuova to get to Burano, it takes about 40 minutes. The exhibition, organized for the inauguration, by Doretta Davanzo Poli [author and expert see a list of her publications here], features over 150 pieces of lace selected from the most significant collections of Venetian Civic Museums, as well as some paintings, engravings, drawings, documents, magazines, textiles and costumes from the 15th to the 20th centuries. During the opening hours of the museum you can see the work of skilled and tireless lace masters, still custodians of an art passed down from generation to generation. The new museum guide will be available from the 27th of June in all the bookstores of the Fondazione Musei Civici. 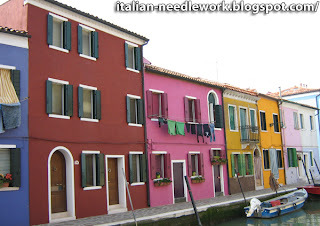 Burano is worth the trip without the museum but with the museum it would be exceptional! Beware of lace pieces with prices too good to be true... they are made in China! 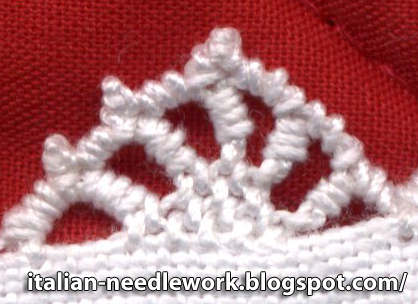 You can check out a video made by master lacemaker Lucia Costantini in the Burano Lace Museum here. Thanks to Vima for the heads-up! Now, I thought, it's probably a lot like the DMC encyclopedia which pre-dates it by a few years but it will be interesting to have all the same - I was wrong - the illustrations are drawn in a similar style but that's about it. 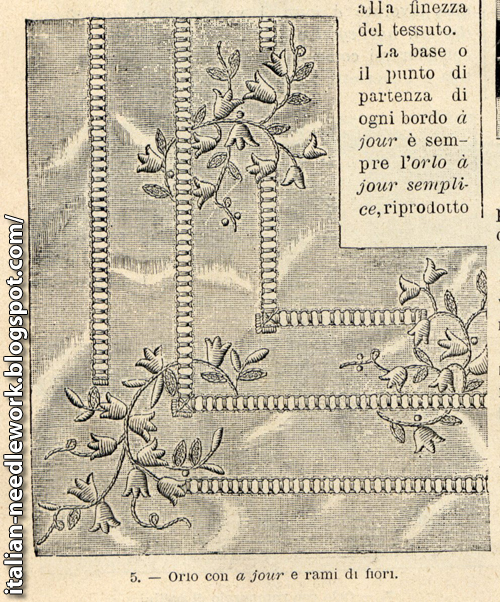 This book definitely has Italian taste where needlework is concerned! 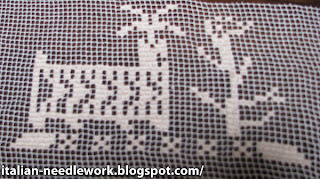 Some of the drawn-threadwork section looked familiar... 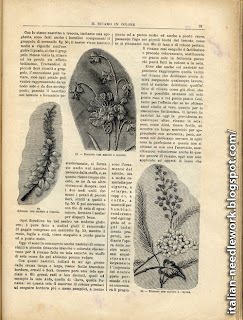 I found it had been previously published in the weekly women's journal Il Ricamo, No. 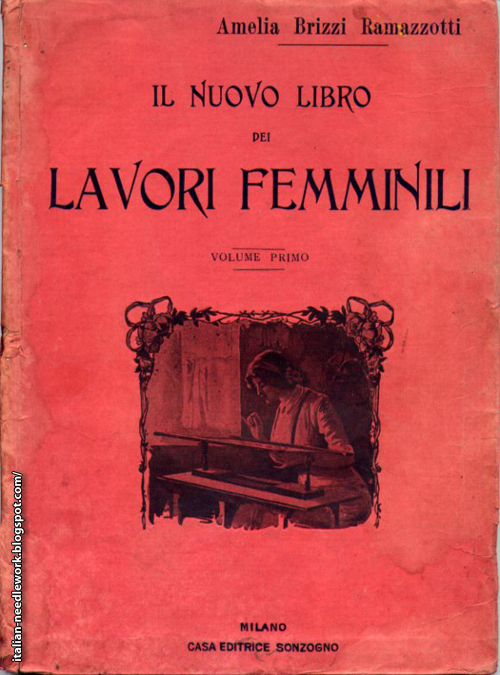 1, 1906 which was also published by Sonzogno. In the 1906 journal it says that the article is a continuation from Il Ricamo No. 53, 1905. 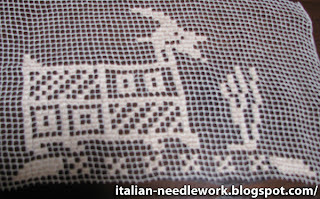 Unfortunately Elena at Italian Needlecrafts doesn't have that issue so I can't check it out (she has generously put up scans of many issues though, have a look when you get the chance!). 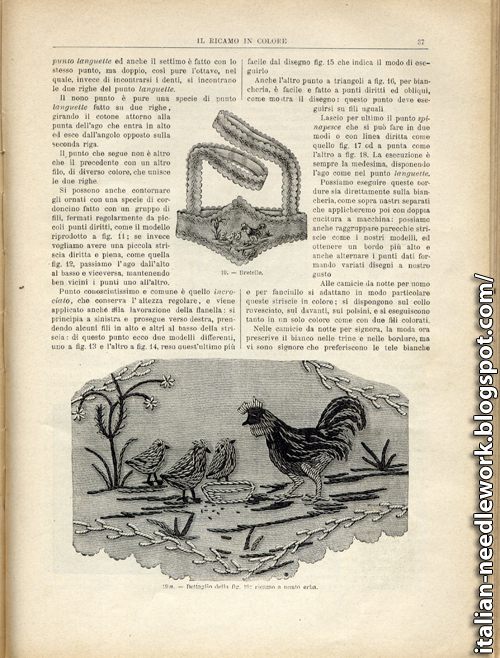 However it would seem that the author Amelia Brizzi Ramazzotti had material for this particular encyclopedia well before it's publication in 1911. 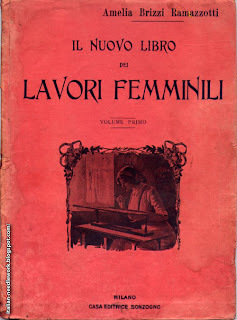 The preface of the encyclopedia says only that she saw the need for a book which had all the techniques of women's work complied together, not that she had taken material from existing publications though it would seem reasonable that she collected material from the same publishing house and a journal that she was the director of. This is a pattern for bretelle which are braces embroidered in Stem Stitch... I wonder what it would be applied to... an apron? Worn over a blouse? If you know, please leave a comment below! It is a great addition to my library and I hope one day to find the second volume which has chapters on: Embroidery on Tulle; Filet work; Knitting; Crochet; Macramé, Tatting; Bobbin Lace, Renaissance Lace, Teneriffe Lace and Needle Lace. 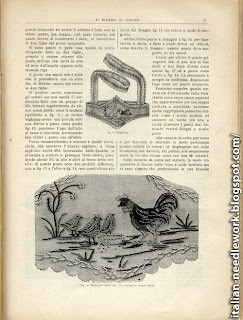 The author Amelia Brizzi Ramazzotti (1872 - 1945) edited and/or wrote several publications in the early 20th century and was the director of the needlework journal Il Ricamo [Embroidery] and Il Ricamo Moderno [Modern Embroidery] during the same period. I have been unsuccessful in finding out much on the life of Amelia Brizzi Ramazzotti, if you know anything would you leave a comment below? I've been corresponding with assistant professor Dr. Silvia Valisa at the State University of Florida who is researching old publications from the Sonzogno publishing house of Milan. She is involved in Project Sonzogno which is trying to collect at least one copy of every old Sonzogno publication for the Sonzogno Historical Library and compiling a catalogue listing of the old publications. Whenever you come across an old Sonzogno publication, please contact her if you don't see it in her catalogue listings either here or here. Donatella Granzarolo, one of the authors of the book Pizzo di Verona - Veronese Crochet Lace, sent me the above samples that she had made so I could see for myself the loveliness of her work. 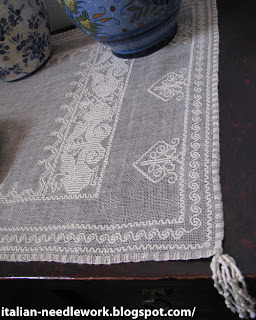 I love the intricacy of this lace. 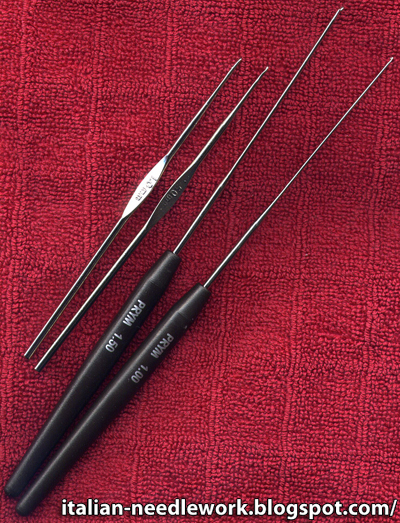 Anna Castagnetti, another one of the authors of the book sent me the crochet and cro-tat hooks used to make Veronese Crochet Lace... sizes 1.0 and 1.5!! They are **so** tiny! Speaking of Anna, there is a lovely little video of her explaining about her work on the Italian program Voce delle Donne [Voices of the Women]. Even if you don't understand Italian, you can see her passion for her work in how she talks about it and the woman interviewing her shows some of Anna's finished pieces of embroidery and lace. p.s. 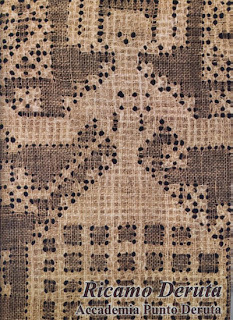 If you go to Anna's website, you can download the original books on Veronese Crochet Lace published in the early 20th century! While in Italy at the Italia Invita Forum in Parma this past month, I took a three-day workshop with the Puncetto needle lace maestra Angela Stefanutto of the Società Operaia di Mutuo Soccorso di Varallo from the Piedmont region of Italy. Angela was an incredibly patient teacher and she had her hands full! There were six of us, two ladies from Spain, two Italian ladies, a lady from Israel and myself. One of the Italian ladies was also an English language interpreter for the Israeli lady and Angela was able to speak to the Spanish ladies in their mother tongue. I admired everyone greatly as learning and teaching an embroidery technique is difficult enough but having to switch languages while you're doing it is even more challenging. 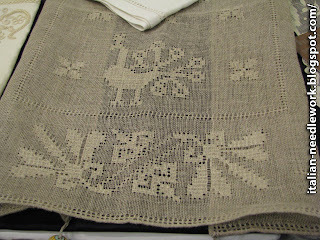 Angela was never impatient and made sure that we were all able to finish our little square of Puncetto needle lace by the end of the course. We each got a little certificate for having completed the workshop and Angela was surprised by getting her own certificate for having taught us! She was a very sweet lady and I enjoyed her very much. 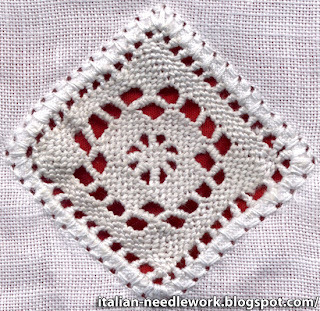 My little square is quite warped but I felt very good leaving the class having learned so much just by watching Angela work her magic hands with the needle and thread. 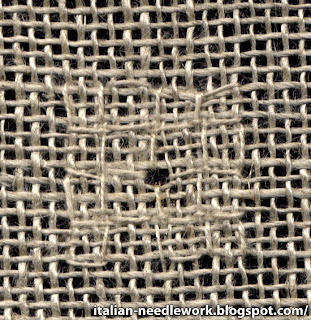 The Puncetto square is worked first and then inserted into the fabric. 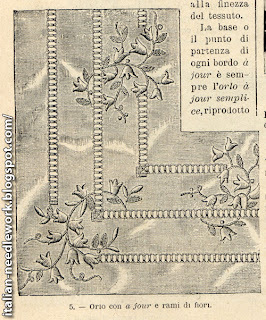 The Ventaglietto or little fan edging is done by hooking onto the hem of the fabric. 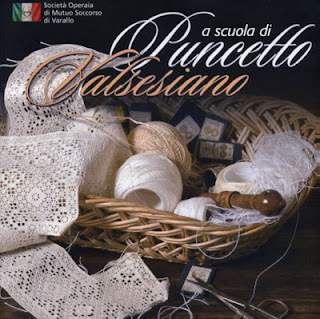 Then she showed us the two books that she co-wrote and all of the beautiful pieces of Puncetto needle lace she had done which were featured in the books. I was delighted to discover that I had both of her books at home! 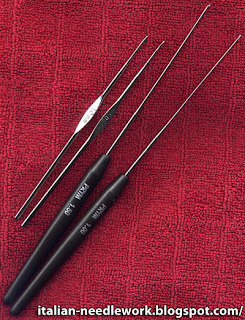 Book number one is really for advanced levels or for once you have a good understanding of the technique. Book number two which is really the one you need to get started. I was excited about getting home to now finally understand the patterns which I had been unsure about when working on my own. Angela told us that if we were ever in her neighbourhood, she taught Puncetto classes for the Società Operaia di Mutuo Soccorso di Varallo. One day I hope to visit her and do just that! In the meantime, there is a series of German videos on YouTube which show you some Puncetto basics. I have a couple of other places to add to my post about great textile-related shopping places in Florence. As some of you may have already read, in this post I told you about some of my discoveries the last time I was there (make sure to read the comments below that post as other people added places too). Campolmi Roberto Filati is almost right behind the Duomo in the historic centre of Florence in Via Folco Portinari no. 19/21 Red. The sell large cones and skeins of yarns and threads of all types, though they specialize in wools. Their prices were fantastic, we saw big cones of embroidery cotton no. 25 for 2 euros! The shop is quite large so make sure you go all the way in and around to the left at the back to see everything. The front window display is quite inviting and well presented but inside the shop there is no decor. Don't let that put you off and be sure to ask about anything you don't see, the ladies know their inventory! 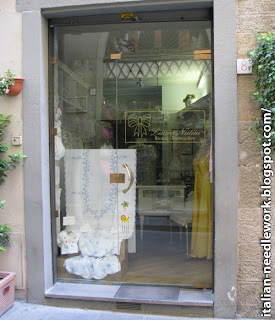 There are the two TAF (which stands for: Tovagliati Artistici Fiorentini or Artistic Florentine Tablelinens) stores in Via Por Santa Maria, no. 17 Red and across the street at no. 22 Red which have beautiful hand-embroidered things, there is one store on one side of the street and the other store which specializes in baby and children's things on the other side, don't miss looking at the window displays of both stores... the children's items store also has a huge display window above the street level window. 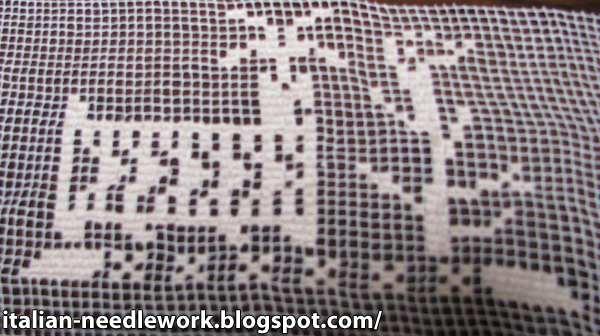 Unfortunately it was closed for the afternoon lunchtime but there was lots of needlework in the window! I'll have to check it out next time. An interesting and attractive approach to wearable art! 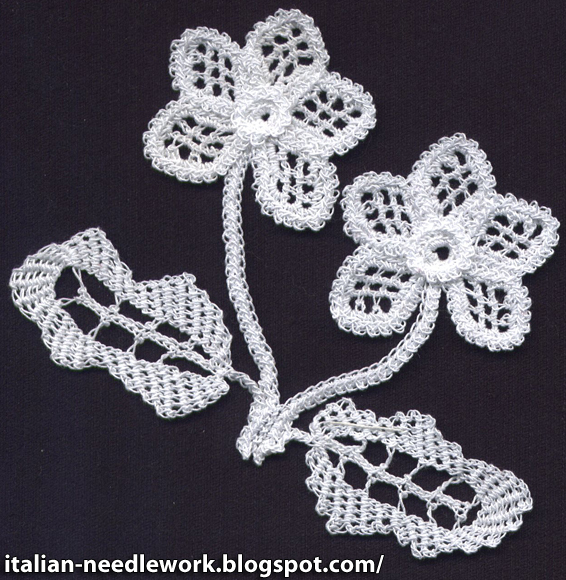 Filet Lace Jewelry made in Sardinia. 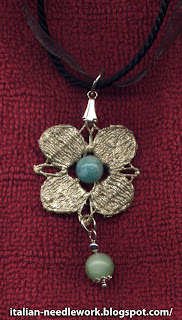 This necklace was a gift to me, it is hand-made Sardinian Filet Lace from Cagliari which has then been coated with fabric glue and then painted with fabric paint so it is durable and can get wet without destroying the work. Each piece is made on a frame in the traditional Sardinian way, the Filet Lace is then embellished with coral, Swarovski crystals or other semi-precious stones and then treated with non-toxic fabric paints and glues. The hardware is made of silver or gold-plated brass or other non-nickel metals. 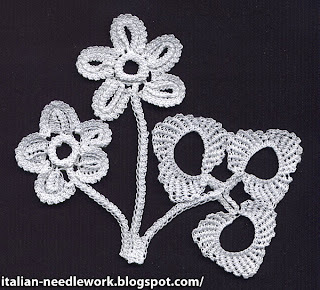 These Filet Lace Jewelry creations are the work of Mariangela Porcu, an embroiderer and teacher of Sardinian Filet Lace. 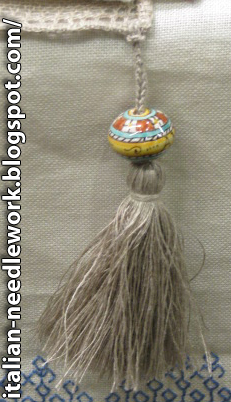 She makes pendants, earrings, bracelets and sets from traditional Sardinian Filet Lace as the base of the designs. All of her creations are exquisite! 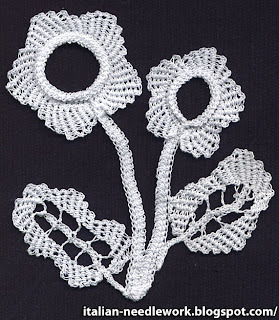 Click here to see an exhibit of some of her brooches and other Filet Lace Jewelry. 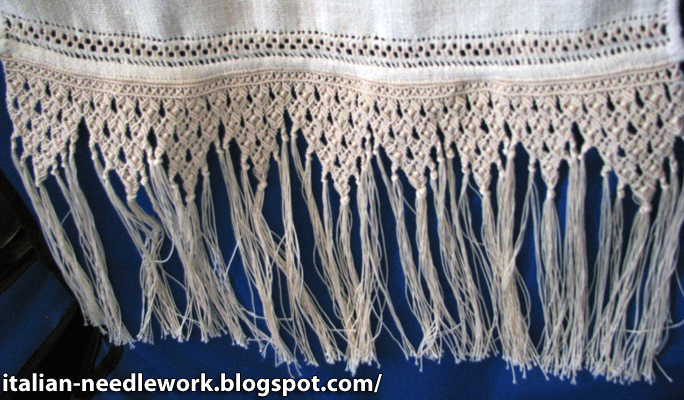 While you're visiting Mariangela Porcu's website, don't miss the gallery of photos of her lovely Sardinian Filet Lace works! 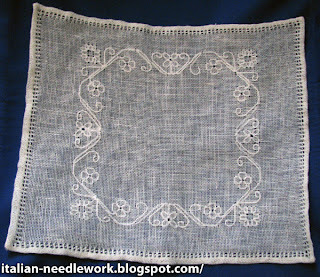 I have written previously about Antique Deruta Embroidery which is a pulled thread technique (not to be confused with Deruta Drawn Thread Work or Coloured Deruta Embroidery). 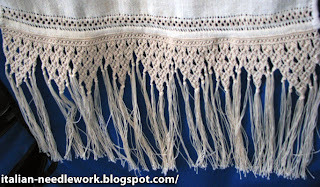 Modern Buratto fabric and linen thread are used and this embroidery it is especially effective when done on curtains as the patterns show up nicely when light is behind them. 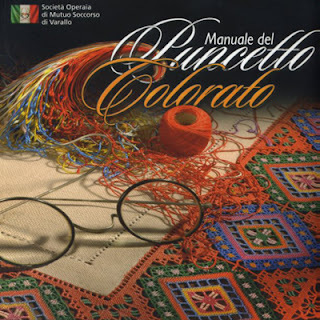 I was delighted to find that the Accademia Punto Deruta had finally published a book on this technique after more than 15 years of researching ancient pieces. 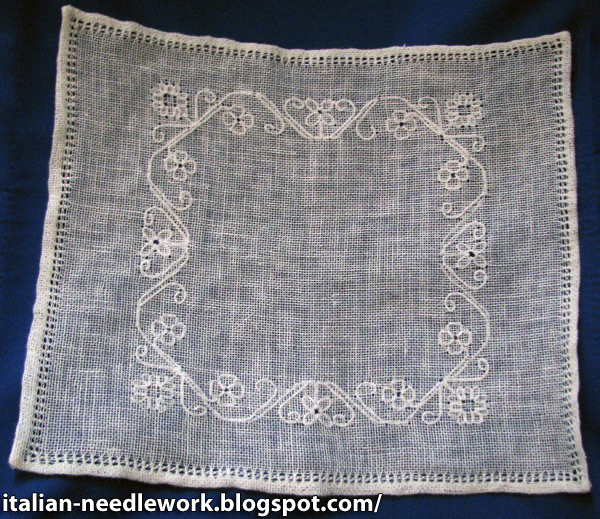 There is a bit of the history of the different Deruta embroidery techniques on the first page and then 12 patterns for Antique Deruta Embroidery which have photos of the patterns stitched up beside each one so you can see the end result, these are followed by instructions on how to execute the two main stitches and photos of different typical hem treatments, then instructions on how to make a tassel with a fuseruola or ceramic bead. After that there is a page on the history of the fuseruola and a series of photos. 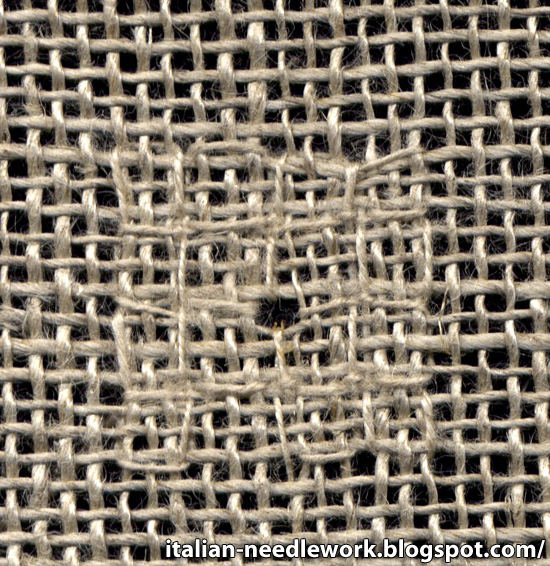 ...you can see the hole that is formed by the path of the pulled threads in the middle. 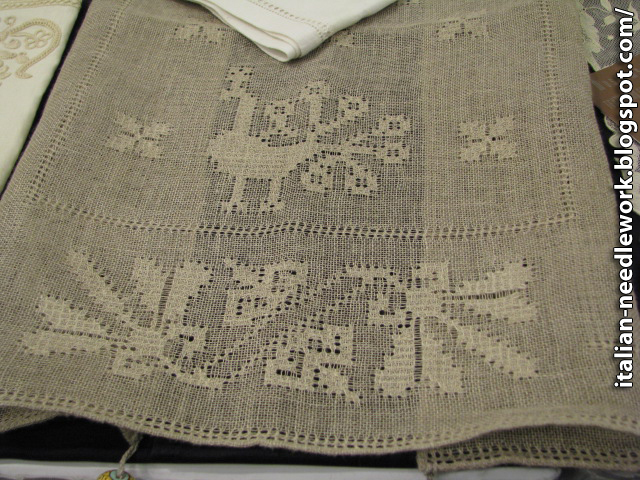 The secret to Antique Deruta Embroidery is the path of your stitches. 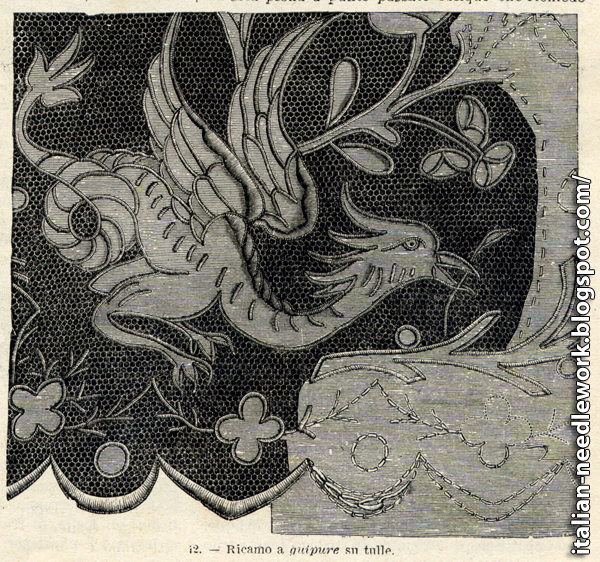 You can read the history of Antique Deruta Embroidery at the Tuttoricamo website, click on the British Flag for the English pages, then 'Techniques', then 'Deruta Embroidery', don't miss the history page under the 'Links' heading on this page.